I watched two men well into their 60s get into a physical fight at the ski hill yesterday. I’d taken a break to sit in the sunshine and give my knee a moment to tell me if skiing was a good or bad thing to be doing. I watched a family of three ski up beside the chalet. The woman in her late 40s stepped out of her skis and headed into the chalet. The man (man #1) in his early 60s and a boy of fifteen then stepped out of theirs and walked into the chalet. As I watched this unfold, I had a feeling I should go and tell them that they should put their skis in the racks, rather than leave them laying about, but I chose not to say anything. I also chose to not go and move them myself. My rationale: “it’s a quiet Monday April 30 at Marmot Basin, there’s hardly anyone here, I don’t have much energy for this and what does it matter?” It mattered when a handful of people had to dodge their skis when they came upon them unexpectedly, one of them another man in his 60s. Man #2 marched up to the skis and picked up a pair and some poles and threw them toward the racks, then another a violent swing of skis. His hands were on the last pair when I saw man #1 heading toward him with great speed. He pushed straight into man #2 with a shove, shouting, “don’t throw my skis”, and they pushed and shoved, with man #1 trying to throw punches. (It still seems stupid to me to fight with a man with a ski in his hands.) In seconds a man nearby was shouting at them to stop, soon joined by the woman now out of the chalet. After a few moments, when man #1 let go, man #2 walked away. I could hear snippets of the woman telling man #1 that his behaviour was bad, that it is important to notice the etiquette of a place and do what is expected, and how he was treating her was not ok.
Violence is not only physical, it is emotional, so do what you need to do to look after yourself, because you’re worth it. Now ready ski myself, I had to move by this family of origin to get my skis and ski over to my kids now waiting for me. I paused to say I saw what happened and man #1 snapped at me, so I moved on. The woman stopped me, wanting to know what I saw. I told her: man #2 threw the skis and he should not have done that. I came to say I saw you leave them in a bad place and I chose not to tell you to move them, and I should have. And your man’s reaction to the situation was both inappropriate and way out of proportion. In a moment, I learned from her that he does not hit her, or is physically rough with her, that they have no money in their shared bank account but he has an unknown amount separately, enough to fund an impromptu trip to Mexico with a hunting buddy. I said to her, reminding her that I am a total outsider who knows nothing about her situation other than what I just saw, this: violence is not only physical, it is emotional, so do what you need to do to look after yourself, because you’re worth it. What I did not say to her: when you exercise your sovereignty (I like the language of sovereignty that Heather Plett uses), he is not going to like it. When you put in place the boundaries you need to be not only safe, but healthy, he is not going to like the changes to his life that come with that. He will find the new you disturbing and destructive to his sense of self and he will do everything he can to claw you back into that place that is unhealthy for you–even while telling you he loves you and supports you. In simple terms, he will do this because he won’t like that it means his world must change. In simpler terms, he won’t want to lose the benefits he enjoys with his power over you in the current arrangement. What I did not say to her: when you exercise your sovereignty, he is not going to like it… He will find the new you disturbing and destructive to his sense of self and he will do everything he can to claw you back into that place that is unhealthy for you–even while telling you he loves you and supports you. In simple terms, he will do this because he won’t like that it means his world must change. In simpler terms, he won’t want to lose the benefits he enjoys with his power over you in the current arrangement. To be in relationship without the power imbalance will require two things: she has to do the emotional labour of figuring out what she needs, speaking it, and demanding what she needs when necessary, and he has to do the emotional labour of receiving it and allowing his sense of identity to shift, even be radically changed. She may choose to stay under his power, and he may choose to work hard to keep her there. They will both choose what they are capable of handling (without judgment). This microcosm of power dynamics is playing out at much larger scales right now. People are figuring out what they need and speaking it and demanding it (#metoo, Black Lives Matter, or the Truth and Reconciliation Commission work in Canada) and those of us in power have a choice: deny and fight, to protect against threats to our sense of identity and power, or accept and welcome the changes that come with finding new ways to live together that are equitable, not skewed in favour of us. Those of us in power have a choice: deny and fight, to protect against threats to our sense of identity and power, or accept and welcome the changes that come with finding new ways to live together that are equitable, not skewed favour of us. I include myself in the ‘us’ here as I have enjoyed and continue to enjoy a life of white privilege. Here’s a question I ask myself: “How does what others share about their experience threaten my sense of identity, and how does that sense of threat lead me to deny their experience so I can maintain my position of privilege”? Deep down, I have a choice about whether to fight to maintain the status quo and my place of privilege, or do the inner work that allows my sense of self to grow into understanding the conscious and unconscious ways I benefit from being white. It is from here that I am able to support others in their growth into their sovereignty without continuing to threaten or harm them. At small and large scales, this is about how the experience of those who have experienced less power historically is allowed and invited to change the identity of those enjoying power. This is not easy work, for anyone, and it is necessary. It is a struggle about power. There is the difficult work for the people who exercise their sovereignty—tell of their experience and what they need—and experience and withstand the backlash. There is the difficult work for people traditionally holding power now told to find a way to accommodate the rising sovereignty. And then I think of the two white men in their 60s, enjoying a day of skiing with friends and family (a privileged life just like mine), fighting each other to protect their skis (not like me). For a moment, a part of me thought we should be supportive of men like this, men I imagine are having a hard time with the pressure to change who they’ve always thought they’ve been (i.e., it’s not ok to touch women when without consent, it’s not ok to deny the experience of People of Color, it’s not ok to deny the attempted cultural genocide of Canada’s Indigenous peoples). It was only a moment before I realized these men are stand-ins for all people who experience the benefits of power, and this pressure to no longer be who we’ve always been is not to be denied; this pressure is necessary and it needs to be experienced or we, as a whole species, will not move through it. These men are stand-ins for all people who experience the benefits of power, and this pressure to no longer be who we’ve always been is not to be denied; this pressure is necessary and it needs to be experienced or we, as a whole species, will not move through it. We are all moving through a recalibration of power relating to any form of inequity (gender, race, etc.). Most often, change only happens when we are sufficiently uncomfortable. Writ large, denying ourselves discomfort is not helpful to our growth as individuals and as a species because we need that discomfort to improve ourselves. White culture, men and boys, or whoever is on the better side of a power imbalance, do not get to dodge the truth of harm because they feel ‘harmed’ by hearing about the harm they’ve caused, or ‘harmed’ by the consequences of their actions. Harm and hurt are not the same thing; when my bad behaviour is pointed out, I am not harmed, I am hurting (though I may feel harm if I have escalated my reaction to be highly defensive of my sense of self). Telling each other what we need to tell is uncomfortable and necessary. Hearing what we don’t want to hear is uncomfortable and necessary. It hurts. We may feel—or be told—we are causing harm by doing this, but we are causing more harm by not speaking and receiving what needs to be said. Telling each other what we need to tell them is uncomfortable and necessary. Hearing what we don’t want to hear is uncomfortable and necessary. It hurts. We may feel—or be told—we are causing harm by doing this, but we are causing more harm by not speaking and receiving what needs to be said. Exercising sovereignty is disruptive, as it should be, because it compels us to honestly look at how we relate to each other. The invitation you send out into the world matters – it says everything. An invitation is both the physical (or digital) thing you send out into the world for an event, and it is also the vibe you send out ahead of it, with it, and afterwards. It is physical and non-physical. Two clients last week exemplify this. First, a city planner colleague responsible to write a new affordable housing policy for his employer, a municipal government, knows that he doesn’t know everything he needs to know to do this. He wants to check in with a range of people to discern the municipality’s role – in today’s context. He knows he needs to know more. He’s actively inviting a range of voices to influence what he will write. Second, a school division initiating gay straight alliance groups in its schools has reached a subtle but big understanding – there are lesbian, gay, bisexual and transgendered adults in schools that need care and attention. They have realized that for schools to show up well for kids, the adults also need love, generosity and support. This is the conversation they are stepping into. What is significant about these folks is the clarity with which they are inviting others to join them in conversations about their work – whether about housing or teaching. Long before an invitation to gather is extended, they are taking the time to get clear about why they need to gather, and deepening into the purpose of each gathering they will call. This is information they will share with the people they gather, and each time we gather, we will spend our time to serve the need and purpose articulated. Posted on March 24, 2015 March 21, 2015 Author Beth SandersCategories Art of Hosting, Conversation, My work, Nest City: The Human Drive to Thrive in Cities, Part 1 - City Patterns, The City ImpulseTags Art of Hosting, Invitation, Nest City, Social HabitatLeave a comment on What are you inviting? When you follow your passion in your work to make the world a better place, you create the force that generates and regenerates our cities. You are what our cities need. We are what our cities need. A Habitat Manifesto explains why. I have just published the latest edition of the Nest City News – A Habitat Manifesto. The special feature of this newsletter is a link to what has come of the first series of posts from the Nest City Blog. As its own publication now in draft form, A Habitat Manifesto explores our evolutionary impulse to build, organize and thrive in cities. I am inviting folks to review this document before formal publication. Only subscribers have the first chance to explore A Habitat Manifesto and explicitly feed and nourish each other in our work for cities and citizens. Leave your name and email address to the right to stay in touch. A few weeks ago, as I was walking through my city, right in the middle of it, I came across a bold and wild coyote. We stopped and looked at each other for a bit, but as I looked away for a moment to put my hand on my phone for a picture, it vanished. It was a wonderful reminder of how the city is in relationship with its region ecologically as well as socially and economically. The coyote is an example of how the wild reaches into the city. Wild animal life reaches into the city, either straight in across the land or through the tentacles of rivers and the natural landscape. The wild also flies overhead, or burrows underground. We are surrounded by the wild. The city itself reaches out beyond its boundaries into the wild. The development of the oil sands in northern Alberta’s boreal forest is an example of the city reaching out into the wild. This development is taking place because of our energy demands around the world, which in so many ways are related to city life. The influence of the clinic is far beyond Edmonton. People who come from a significant distance will have the potential to do many things with one trip ~ Dr. Dylan Taylor. Each city is in relationship with far more than the citizens within its boundaries. The Kaye Edmonton Clinic will serve citizens in the Edmonton area as well as northern Alberta, Saskatchewan and the Northwest Territories. This facility’s reach is far beyond its host city; in fact, it reaches into the wild. The wild reaches in and the city reaches out. Where is the wild in your city? How does your city reach out into the wild? Interested in urban coyotes? Check out the Edmonton Urban Coyote Project, a study out of the University of Alberta about coyote habitat, coyote diet and the knowledge and perceptions of residents about coyotes. It seems that coyotes have been inhabiting cities across North America at increasing rates over the last 20 years. They are in Los Angeles, New York, Austin, Toronto, Chicago, Vancouver, Calgary and Edmonton. Nest City is in three parts. Part 1 looks at new ways to see patterns a cities that take into account the city’s complexity. Part 2 proposes ways to organize ourselves to see those patterns and use them. Part 3 articulates how to integrate the organizing patterns to co-create cities that serve us well. Part One – City Patterns is behind us. (Until I add more!) It articulates the evolutionary relationship between humans and our habitat – our cities. We have a distinct impulse to build cities, organize them and thrive in them. Part Two – Organizing for Emergence is next. It will explore our organizing patterns: we organize to reach a destination, we experience uncertainty along the way, and the future that comes to pass is something unexpected at every turn. I will show you how the nest works: destination, journey and emergence. Part Three – Nest City, will integrate these elements of destination, journey and emergence. I will show you a second level of ‘nestworks’ that articulates how our city making and civic practice relate to the city that is emerging. And of course a sweet spot where it all comes together. Here’s another way to look at Nest City and how it is organized: John O’Donohue’s blessing below. The first five lines capture Part One. As linear as we think the creation of cities is, it is always unfolding. There may be patterns in cities, but they are emerging. We do not know exactly what they will be like. Part Two is captured with the text beginning with the words, ‘Often we only know it is time to change’, through to the line, ‘Into the unknown that beckons us;’. We often know it is time to change but we can not put our fingers on what needs to change. We feel uneasy but we are not sure why. We lose track of our destination and may be adrift, yet there is always something unknown that beckons us. Part Three acknowledges, as the rest of the blessing does, that we are called to offer great trust in the unknown. We know, quite deeply in our very souls, that we can move beyond the confinements we confine ourselves with, and unleash our soul’s desire. I wonder what our collective souls’ desire. I wonder what the city’s soul desires. This note to myself has been sitting on the side of my desk for a while, waiting for the right time to act on it. Now that my immediate tasks as Co-Designer, Interviewer and Harvester for the Integral City 2.0 Conference are looked after, I can refocus on my writing here. The last month has been gruelling. Every Tuesday, Wednesday and Thursday in the month of September explored one of the 12 evolutionary intelligences of the human hive, as identified by Marilyn Hamilton. I co-designed the program of over 50 visionaries whose work makes the world a better place, many of whom I had the opportunity to interview. My other role was to catch the story of each day and grasp the essence of each intelligence and the conference as a whole. This window into the growing planet-wide community of thinkers, designers and practitioners confirms my belief that our work is the life force of our cities, whether we realize it or not. Our work, and our approach to our work, is what releases our true potential IF that work is aligned with what we wish to offer the world. The more our being is aligned with what we do, our work, the more our cities meet our needs. My September experience compels me to revisit many of my posts since my declaration in April to blog my book, Nest City: The Human Drive to Thrive in Cities. So far, I have shared three chapters with you: 1 – The City Impulse, 2 – The Planning Impulse, and 3 – The Thriving Impulse (click here for a recap). They paint a picture of how cities come about and the nature of our evolutionary relationship with cities. Behind the scenes, I will be turning these first three chapters into their own publication that I will share with all readers as soon as it is complete. On this blog stage, I will share Part 2 of Nest City, focusing on how we can effectively organize ourselves in cities by taking into account our destination, the journey and the emergence of ourselves and our cities. My Integral City 2.0 Online Conference expedition has fed my desire to dig deeper into our relationship with the cities we create. 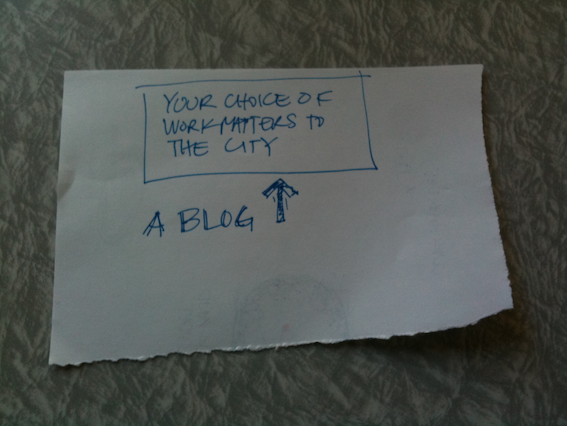 My next post will revive the plot for of the city’s new story: organizing for emergence. My home, my nest, is getting an overhaul. And it has a hole in its roof. The truth is, we put the hole in on purpose, which is a little counter intuitive. But we have our reasons. Our home is a post-war building with very little insulation, and little or no ventilation, so we are installing a new roof on top of the old roof to improve the building’s ability to keep itself and it’s occupants warm and dry. We decided not to simply replace the shingles, for that only solves a portion of the building’s challenges. We have chosen to improve how the whole roof system works for the building. We decided not to build a whole new nest; we are making an investment in this one. She has lots to give us yet if we look after her. There is a part of us that would love to make massive changes to the building. We realize that the space gained with an addition will not be needed in less than a decade (kids are 12 and 14). We also don’t have the strength to organize ourselves for a big reno. We also don’t wish to put our money in a big reno. But that doesn’t mean that we don’t want to treat ourselves. We chose a skylight to light up the stairwell and serve as a solar chimney on hot days. So our contractor cut a hole in the roof. As we stood in the stairwell today, the kids and I looked through the roof out, over the neighbourhood, right through the fresh air. In the evening it is covered with a tarp, but as we move up and down the stairs we can hear the hum of the city. When it rained last night, it sounded like we were sleeping in our tent. As I was falling asleep last night listening to the rain I realized that roof has an important job. For our species, we need to have somewhere warm and dry, our shelter, to survive. The very roof we choose to build on our shelters reflects our life conditions. Our home was built in a time when energy to heat homes was abundant and cheap. Energy is more scarce and more expensive and we are compelled to improve our building. Our context changes and we eventually change too, and our structures, our physical habitats, with us. It took a hole in the roof for me to realize that the new roof is really about, at a family scale, fixing our nest, our family habitat. We are doing what we need to do to make sure the building functions well. We are also moving beyond pure function and sorting out as a family how we can ‘dress up’ the building so it conveys our style, our identity. We have a chance to put our mark on our nest. As we come and go from our nest, we come and go from a place we have created for ourselves. A home can pull on the heart strings and we are choosing colours and materials that pull on our heart strings. We are also adding to the neighbourhood’s identity of itself. Collectively with our neighbours, we make our streets and neighbourhood. Everyone’s choices accumulate to a feeling about our place and our collective identity. When we chose to put in a skylight, it felt gratuitous. But I am glad we put the hole in the roof. Every time I travel the stairs I will be able to see the neighbourhood, the treetops and the stars from a new vantage point. In these Nest City posts, I have looked at cities in three ways so far: our impulse to build and gather in cities, our impulse to organize our cities and last, our impulse to thrive as a species. In exploring each of these three impulses, patterns about our cities are revealed that are crucial to understanding how to organize our cities our cities to serve their citizens well – and how to be citizens to serve cities well. Building cities as our habitat naturally occurs for us. We work at this every day – psychologically, physically, socially and culturally. Our work, whether paid or unpaid, is always in response to our habitat. We work constantly to think, make and do new things, which changes our habitat and our responses to habitat. And so on, endlessly. Our relationship with our habitat – cities – feeds the evolution of our cities and our habitat. Given this relationship, it is time to build the nest we need. The overriding purpose of a city is to integrate the needs of its people with its context, to create a habitat in which citizens will survive and thrive. The purpose of planning is to support a city’s efforts to notice, adjust and organize to ensure the city is able to integrate the needs of its citizens with its context. The city is a dance of voices and values and the act of linear planning is simply a level of organizing that responds to a particular set of life conditions. There is a time and place for linear planning, and life conditions are now emerging allowing us to recalibrate the practice of planning that holds a destination in mind while allowing for learning and adjustment along the way. We are learning to live into a reality in which we recognize that we do not know exactly where we will end up. Our cities are built by us and for us. We do this to ensure that we survive, yet as we saw in Chapter One, we have a drive to constantly think, make and do new things in our work. The result is our drive to thrive. This drive results in cities. And cities compel us to think, make and do more new things. This is the essence of our evolutionary relationship with cities: an infinity loop. Seeing the whole city as alive, evolving wholes that need nourishment allows us to navigate toward cities that serve citizens well, and citizens that serve cities well. Part 2 of Nest City will focus on four things: destination, journey, emergence and the sweet spot at the intersection. 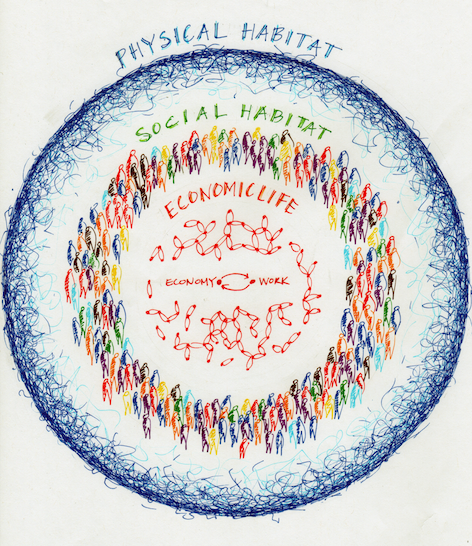 This is the dynamic of how we can set ourselves up to organize ourselves and our habitats well. 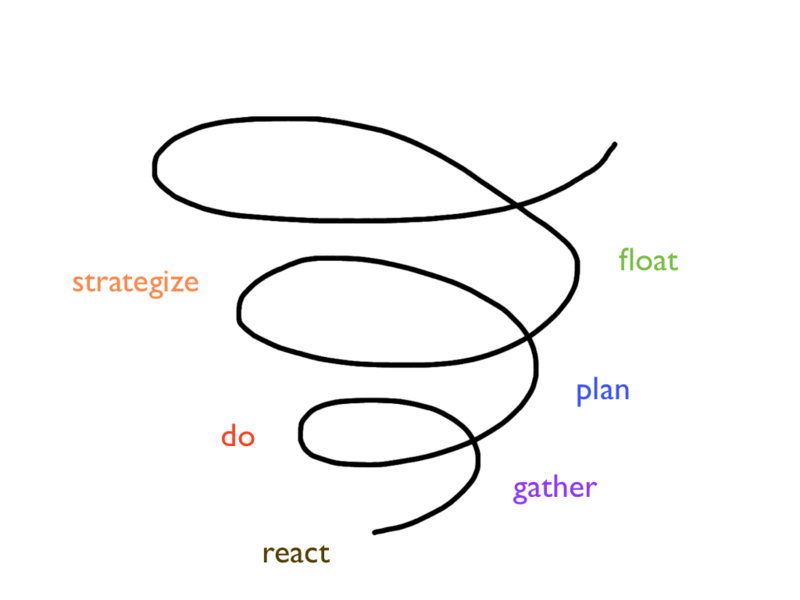 My next post will lay out the plot for Part 2 – Organizing for Emergence. If you are interested in learning more about evolutionary intelligences relating to cities, you will be interested in the Integral City eLaboratory – Co-Creating the Future of the Human Hive. I am at the end of Chapter 3 – The Thriving Impulse. Beginning with my June 13, 2012 post, Pause for evolutionary understanding, I asked this question: where do we need to put our attention to ride out our evolutionary burst successfully? To begin, I explored some theoretical frameworks to shed some light on our evolutionary relationship with cities. I looked first at Spiral Dynamics with a primer, the principles that frame the Spiral and the conditions that guide evolutionary expansion. We grow and develop – evolve – in response to our life conditions. We evolve with our habitat in all aspects of our lives. We have within us an evolutionary impulse to thrive. We see the whole city with integral maps, such as the nesting holarchy of city systems and Spiral Dynamics integral; the four quadrants and scalar, fractal relationships. The four integral quadrants of the city allow us to see the city’s inner intelligence (our conscious capacity and psychological well-being), outer intelligence (embodying right action and biological well-being), building intelligence (creating structures that flex and flow, and our social well-being) and cultural intelligence (feeding each other and cultural well-being). Thinking of cities as alive draws on our ecosphere intelligence and our living intelligence. Seeing cities as evolving wholes draws on our emerging intelligence and our evolving intelligence. And just like any living entity, cities need nourishment. Cities and citizens thrive with inquiry intelligence and meshworking intelligence. Our navigating intelligence allows us to declare a destination and notice if we are on track. Ultimately, I believe we are aiming for cities that serve citizens well – and citizens that serve cities well. This work is about thriving. This is work that never ends. This post wraps up Chapter 3 – The Thriving Impulse AND it also wraps up the first Part of Nest City. Part One – City Patterns has looked at three impulses in the human species: the city impulse, the planning impulse and the thriving impulse. My next post will recap the patterns in our relationship with cities before switching gears and tackling how we can organize ourselves, and our nest cities, for emergence.